There's just a week to go until one of the highlights of summer in Brussels - the twice-yearly Flower Carpet filling the Grand-Place. 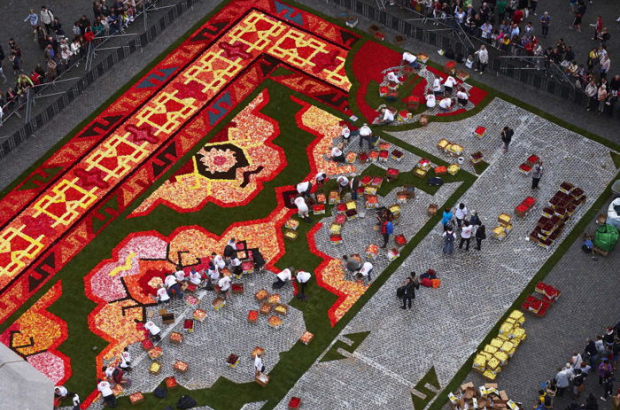 With an elaborate Mexican design - the most complicated to date - the 1,800m² carpet will be filled with more than half a million flowers, mostly begonias. You can jostle for a position to see the carpet from ground level at no cost from 16-19 August - but for the best view, head up to the balcony of City Hall. Sorry! Our ticket giveaway has now closed and the winners have been notified by email. You can still buy tickets from the Grand-Place from 16-19 August. You can see the carpet being built on the Grand-Place next Thursday morning from 5.00. The inauguration is on Thursday 16 August at 22.00 and the sound and light shows run until Sunday 19 August at 22.30.